Many of the Clarion Alley murals that were vandalized Friday night with far-right political imagery — like “Make America Great Again” caps — are now being repaired. Others will be fixed shortly. The Examiner, which first wrote about the incident, reported seven murals total were vandalized. The Clarion Alley Mural Project, which curates and protects murals in the alley, is asking for donations to repair the murals, as the artists usually have to provide their own supplies for their murals’ repairs. 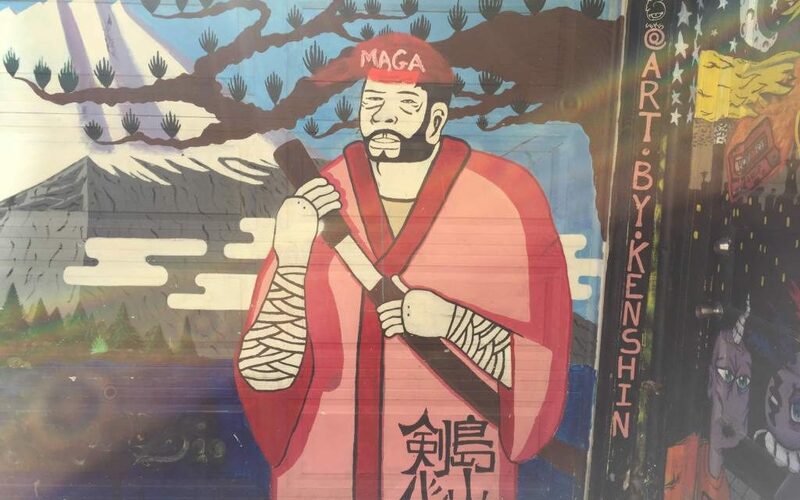 On Monday, one of the more egregiously defaced murals, which depicts protesters against ICE and other social-justice related issues, had been relieved of the more than 30 “MAGA” caps painted on the heads of the people in the mural. A mural that says, “Justice for Saleem Tindle, Mothers Fight Back,” referring to the man that BART police shot and killed in January, was defaced with the sentence, “Kavanaugh justice for all!” which refers to Trump’s U.S. Supreme Court pick. By Monday, that mural had been repaired. Others are still in need of restoration. “If you give a hoot, join those who put their money where their heart is and help us pay for the paint we use to beautify our collective community,” reads a post on the mural project’s Instagram account. Donated! I love these murals! Thanks for letting us know about the vandalism. What out a fund for the vandalized “walks of life” mural? That one was completely destroyed and no one seemed too outraged.